Those bummed over LittleBigPlanet 2‘s 2011 release have been catered to; MediaMolecule will have two doses of Sackboy goodness on offer next month. It will be available via PlayStation Network starting December 22. 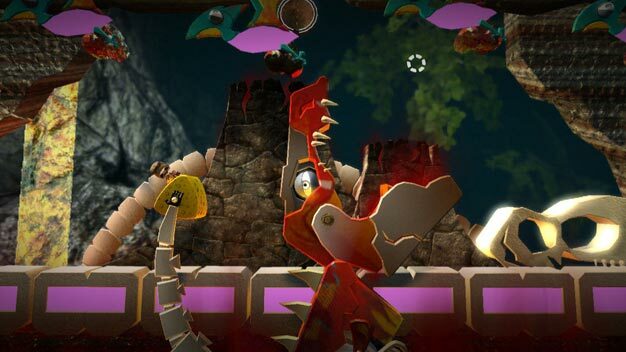 The meatier offering will be Sackboy’s Prehistoric Moves, a stand-alone, Move-enabled co-op-only game. This one requires one player to have a Move controller, while others will be forced to play with the trusty DualShocks: “The player with the PlayStation Move controller leads the way, flicking switches and triggering platforms to help the others, using DualShock Controllers, through each level,” Pavey explains. Prehistoric Moves will be available earlier, on December 15th, for €5.99. It’s also included on the LBP2 disc for free. Again, this is completely stand-alone then. Those who download it do not need a copy of LBP or LBP2. LittleBigPlanet 2 itself will launch in January.